Every diamond is unique. Each reflects the story of its arduous journey from deep inside the earth to a cherished object of adornment. Yet all diamonds share certain features that allow us to compare and evaluate them. These features are called the 4Cs. The 4Cs of diamond grading helps you understand exactly what you are buying. That’s why GIA created this universal standard for diamond quality. 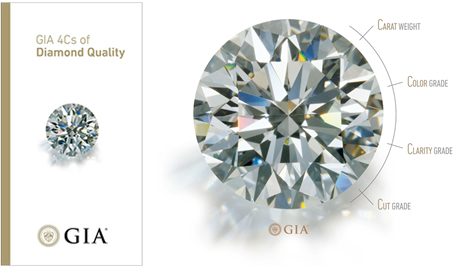 And why we proudly oﬀer diamonds graded by GIA. Although many people think of gem quality diamonds as colorless, truly colorless diamonds are actually very rare. Most diamonds used in jewelry are nearly colorless with tints of yellow or brown. Color grades are determined by comparing each diamond to a master set. Each letter grade represents a range of color and is a measure of how noticeable a color is. Some diamonds can emit a visible light when exposed to ultraviolet radiation, but fluorescence is not a factor in determining color or clarity grades. However, a description of its strength and color is provided on GIA Reports as an additional identifying characteristic. Diamonds are renowned for their ability to transmit light and sparkle so intensely. We often think of diamond’s cut as a shape (round, emerald, pear), but a diamond’s cut grade is really about how well a diamond’s facets interact with light. Brightness is the combination of all white light reflecting from the surface and interior of a diamond. Fire describes the “flares” of color emitted from a diamond. Scintillation describes the pattern of light and dark areas and the sparkle you see when the diamond, the light, or the observer moves. A diamond’s proportions affect its light performance, which in turn affects its beauty and overall appeal. Diamonds with fine proportions, symmetry, and polish optimize their interaction with light, and have increased brightness, fire, and scintillation. For diamonds under one carat, each carat is divided into 100 points – similar to pennies in a dollar. 0.75 ct. = 75 points, 1/2 ct. = 50 points. This informative four-minute video will help you choose a diamond, with the help of GIA, creator of the 4Cs of diamond quality. Whether you’re looking to buy loose diamonds, or how to buy a diamond ring, look to GIA for unbiased diamond quality evaluation. No matter how gorgeous a diamond may look or how beautifully it sparkles, you simply cannot see its true quality. The 4Cs of diamond quality will provide you with the information you need to know the diamond's actual quality, so that you can make an informed purchase. A GIA Diamond Grading Report will make you sure of your diamond's value, quality, and authenticity. Learn more about a GIA report and the 4Cs of diamond grading with this four-minute video. Shopping for a diamond, and want to understand diamond value? You’ll want to know about the 4Cs of diamond quality. 4Cs creator GIA goes to extraordinary lengths to guarantee the highest levels of integrity. A diamond report issued by GIA, which is oftentimes referred to as a diamond certification or diamond cert, ensures that the diamond you’re considering buying has the qualities you’re looking for. Start by understanding how to read a report from GIA. A GIA Diamond Grading Report provides assurance that your diamond is a natural diamond. While other reports from other entities have made their way into the marketplace, GIA continues to be recognized as the original and unrivaled source for accuracy and integrity in diamond grading, due to its status as a nonprofit institute dedicated to protecting the public trust. This informative video will help explain the unique benefits and features of a GIA report.